If you have a green thumb, you may hate those pesky yellow flowers sprouting roots in your front yard, but dandelions may actually be of use. According to Healthline, these flowers have been used in natural medicine for years. The University of Maryland Medical Center notes that this flowering weed contains high levels of Vitamins A, B,C and D. In addition to those vitamins, you'll get a healthy serving of iron, potassium and zinc from dandelions. You can enjoy dandelions by eating them or boiling them to get a tea. Native American tradition and traditional Chinese medicine consumed dandelions for better liver health, heartburn and the easing of tummy troubles, notes the University of Maryland Medical Center. It is also a diuretic and has been typically used when ridding the body of excess fluid can be helpful, such as with liver conditions or high blood pressure. Its ability to aid the body's natural detoxifying mechanism as well the high magnesium and zinc content also makes dandelion a popular aid for women's health. Wellness Mama touts the benefits of dandelion for a range of health issues including urinary tract infections, mastitis, hormone imbalance and to maintain healthy skin. You can create a poultice, or paste, from dandelions. Apply the paste to sores, boils and abscesses to help speed the healing process and ease pain symptoms naturally. 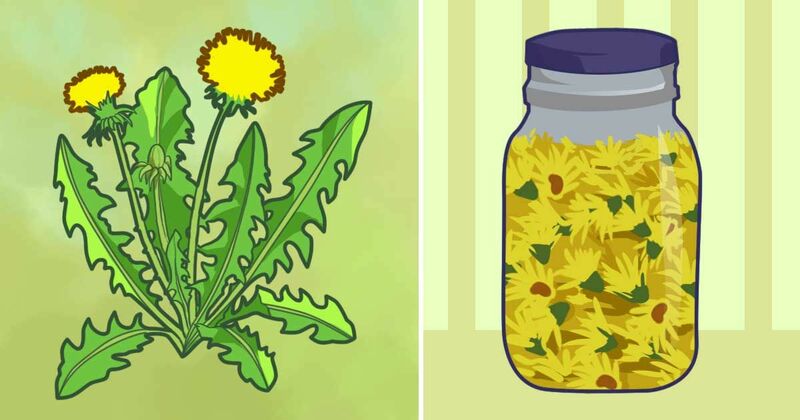 Infuse the oil by filling a jar with fresh dandelions, pouring a base oil (like olive) over the dandelions until the jar is full, and then storing the oil in a warm place for two weeks. Strain and store the infused oil in the fridge between uses, according to Viral Alternative News. Rub this oil on sore muscles or joints to help ease pain and reduce swelling. Viral Alternative News suggests applying sap from the root of the dandelion to warts several times per day. Regular application should help eliminate warts completely. Perhaps a little ironically, the dandelion can be used to make an effective fertilizer. Place the dandelions (including roots and leaves) into a bucket. Add 8 cups of water for every pound of dandelions you have. Cover the bucket with a snug lid and allow it to sit for 2 to 4 weeks. After a few weeks, strain the liquid to remove the fermented weeds (it's going to smell funky), dilute with 1 part weed juice to 10 parts water. Spray this on your plants to help them grow like weeds, according to The Master Gardeners. Dandelions are often the first food of the season for bees, so make sure to leave a few in your yard so they have something to eat too. In addition, dandelions can interact poorly with blood thinners, insulin and diuretics, so use caution if you take any of these medications, UMMU warns. Have you ever tried eating dandelions? What did you think? Tell us in the comments below.